Hylec-APL, is showcasing its latest products for professional installers on Stands 93 and 96 at the Electrical Design and Install Expo (ED&I) at the NEC, Birmingham on September 6 & 7. This inaugural ED&I Expo is sponsored by the Electrical Contractors Association and provides an opportunity for all sectors within the electrical industry to see new products and new technologies, while encouraging the cross-fertilisation of ideas across industry sectors. Hylec is showing electrical and electronic products from across its broad range, which includes control stations, junction boxes, cable glands, waterproof connectors, enclosures, PCB terminal blocks and holders, HVAC, motor control gear, DIN Rail Enclosures & Accessories and more. Among the new product introductions on display is the new TeePlug® TH381 plug and socket electrical micro connector. Designed for underwater use and harsh environment installations, the TeePlug TH381 is IP68/IP69 rated and ensures electrical connection even when permanently submerged in water and subjected to high pressure water jets. Measuring only 14mm in diameter, the TeeTubeTH381 Series installs faster than competitive systems and has a special coupling system which ensures correct alignment and prevents accidental disconnection. TH381 connectors suit outdoor lighting applications, such as architectural lighting, street lighting, underwater lighting, illumination of road signs and billboards and the connection of interior and exterior Class 2 electrical devices. To coincide with ED&I, a new product extending the ISOLATOR range is being announced. 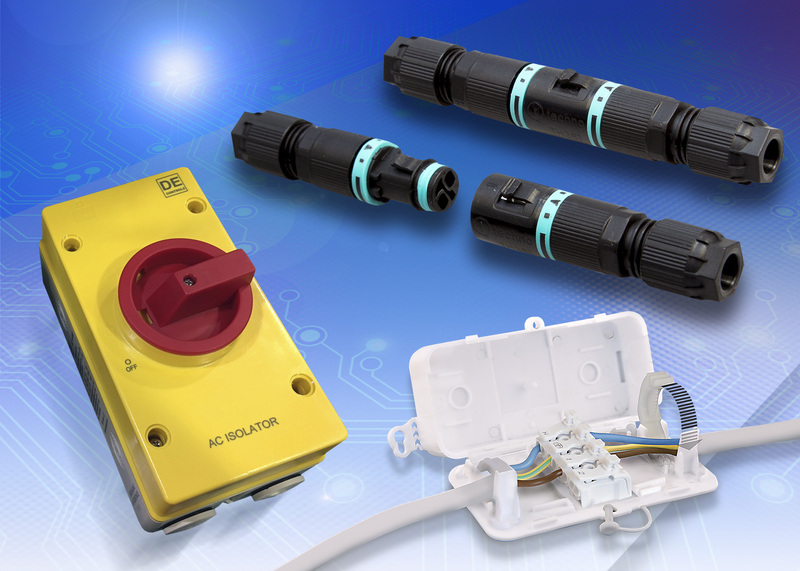 ISOLATOR control switches ensure fast electrical isolation for industrial machinery, commercial buildings, power supplies, security equipment and HVAC installations. The new ISOLATOR AC 80A model is manufactured from completely flame-retardant polycarbonate rated to UL94V-0, providing an additional and often vital margin of safety over competitive products with a lower flame-resistance rating. It is also IP67-rated, to protect against water up to a depth of 1m, and boasts the best price/performance on the UK market. The whole ISOLATOR range from 20A AC upwards, including DC models, have a unique enclosure size which has a generous cable management dimension for easier installation. At ED&I, there will be another opportunity to see Debox SL, the UK’s first maintenance-free in line cable junction box. 100% tool-less assembly is establishing Debox SL as the professional contractor’s junction box of choice: with all required components to hand, including a 4-pole terminal block, assembly takes seconds, saving a great deal of on-site time during the installation of ring-main lighting, LED lighting and power. Hylec is running a terrific on-stand promotion at the show: each day the fastest person to wire a Debox SL will win a great track day driving experience. Hylec’s new catalogue will also be available at the show as a print edition, as well as being available digitally online.